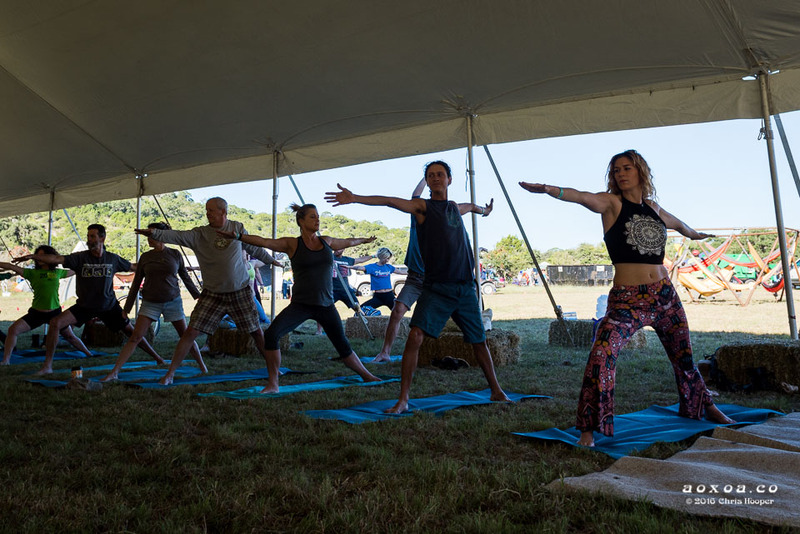 UTOPiAfest ranks as one of the most unique music and camping festivals in Texas. 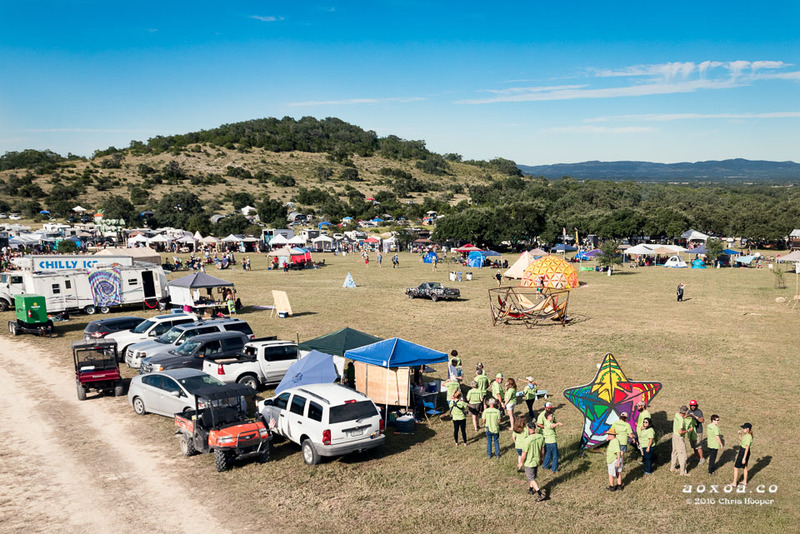 Framed by majestic hills, the festival takes place in a small valley on the 1,000 acre Four Sisters Ranch. The small red dot marks the festival grounds. This is a fairly remote part of the Texas Hill Country where the Sabinal River and its tributaries formed the deeply sculptured Sabinal River Valley in the southern edge of the Edwards Plateau. The picturesque Sabinal River Valley contains a feast of scenery that unfolds along Hwy 187. The highway passes Lost Maples State Natural Area (the Sabinal River’s headwaters) at the north end of the valley where you can find true canyons of the Hill Country. Heading south, the valley broadens between the rugged hills until it slowly tapers-off to an end at the edge of the Balcones Escarpment. As the crow flies. 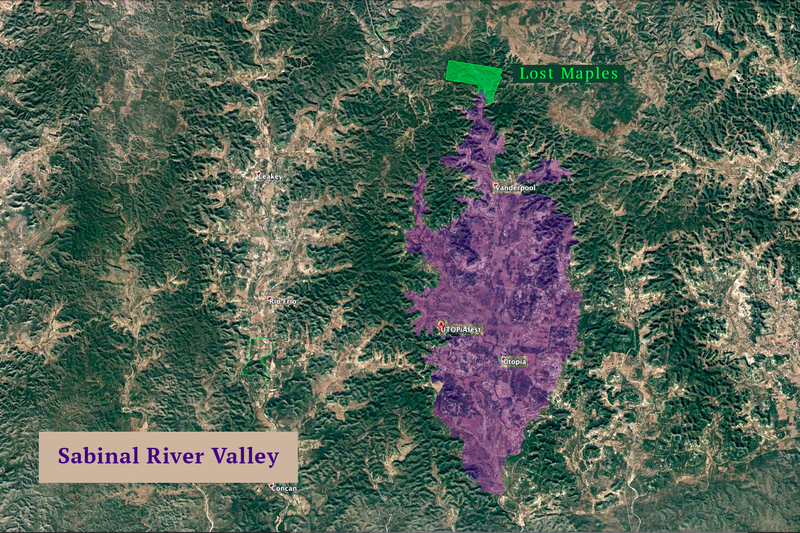 the oval shaped Sabinal River Valley is 20 miles long north to south and about 10 miles at it widest point from east to west. 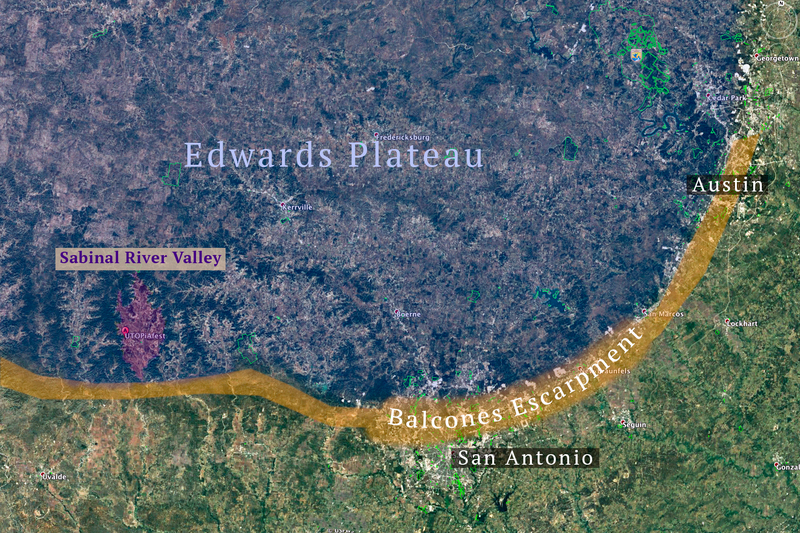 The Sabinal River Valley in relation to San Antonio and Austin. 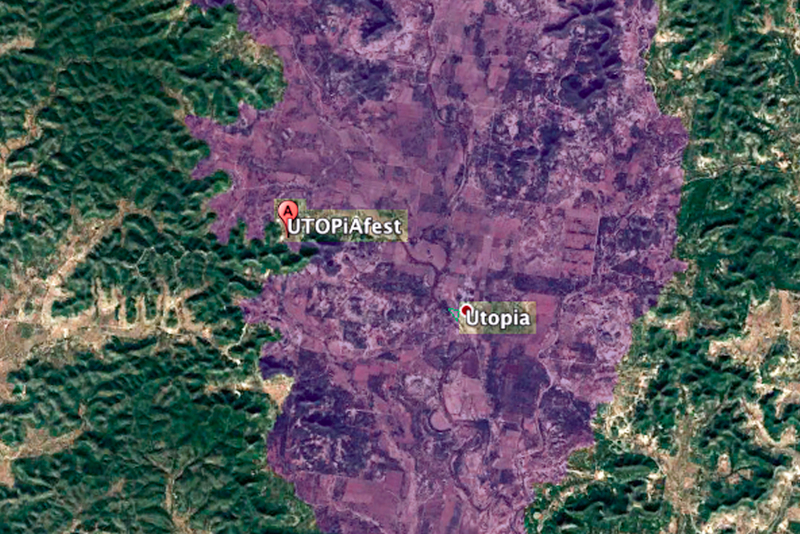 The red dot is the festival grounds of UTOPiAfest. Utopia, TX is one of two towns located in the Sabinal River Valley. 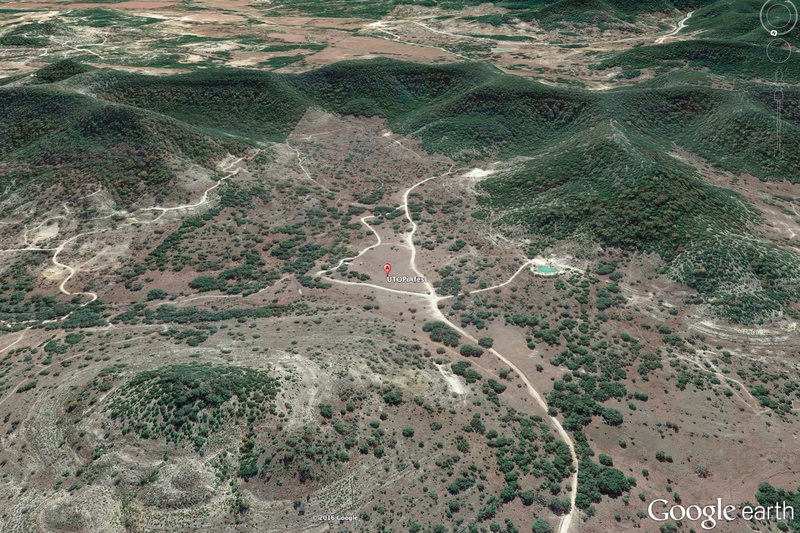 It is just over halfway between the north and south end of the valley. 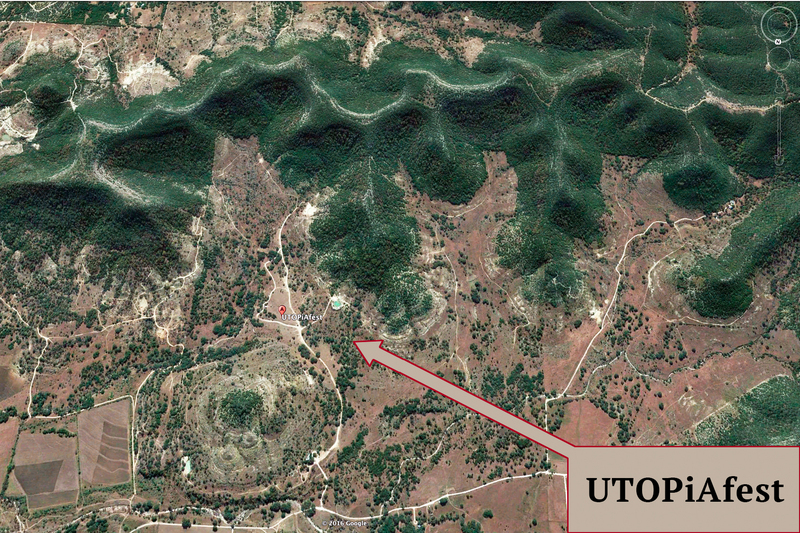 Utopia is a rural community that dates from 1852. It currently has a population of about 250. 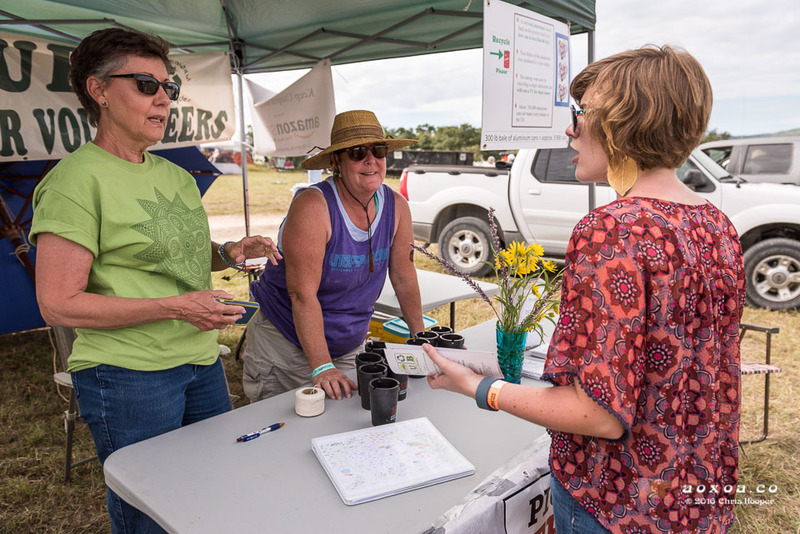 This curious place is the namesake of UTOPiAfest, which is located about six miles northwest of town—practically on the edge of the Sabinal River Valley. 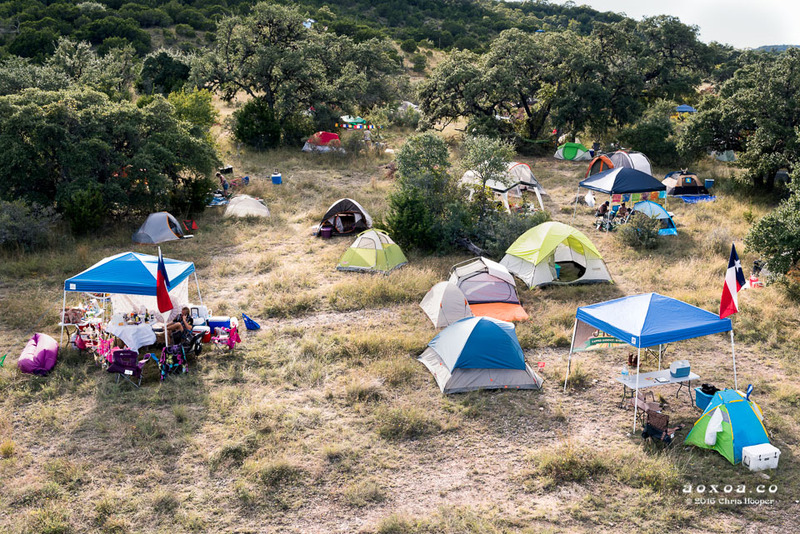 UTOPiAfest, a remote Hill Country location near Utopia, TX. 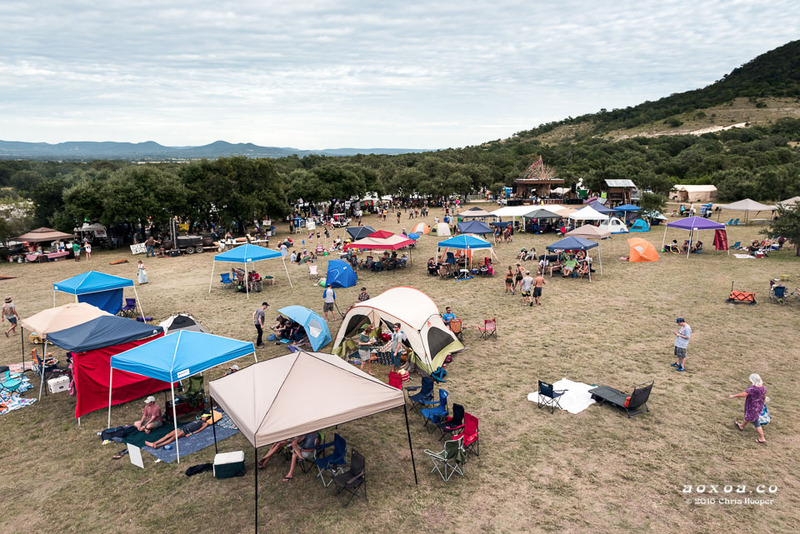 To be clear, UTOPiAfest is surrounded by scenic vistas that are far superior to any other Texas music festival. 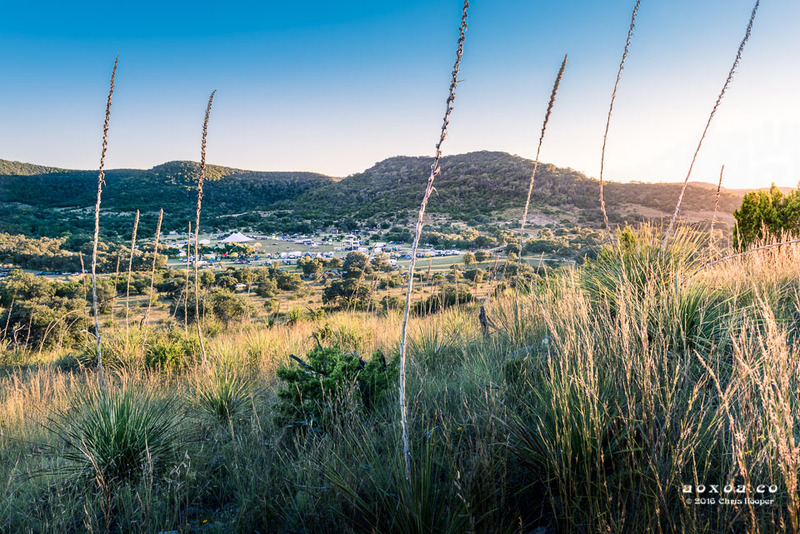 Situated in a natural amphitheater on the Four Sisters Ranch, this idyllic pastoral setting features live-oak groves that stretch to the dramatic hills of Edwards Limestone and Glen Rose material thick with sotol, ashe juniper, flameleaf sumac, and the occasional prickly-pear cactus. 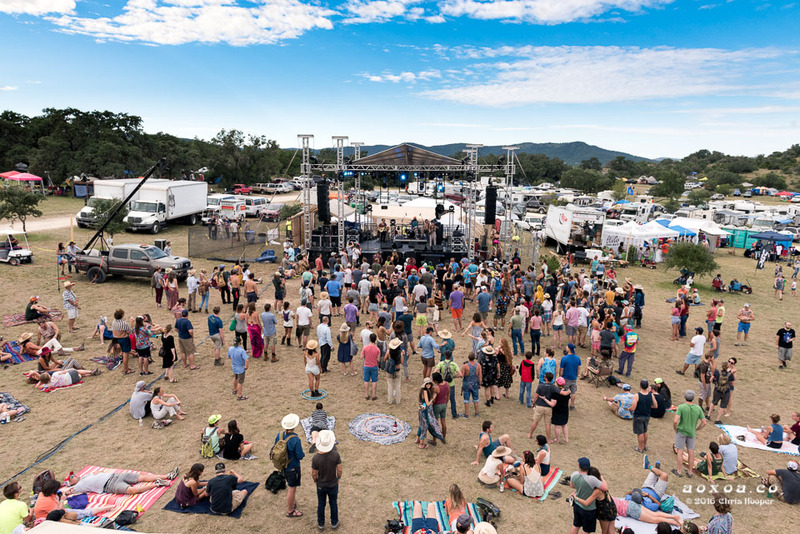 This southward view presents a small red dot that marks the festival grounds where the stages and vendors are located. The open field is about 300 yards long by 200 yards wide. 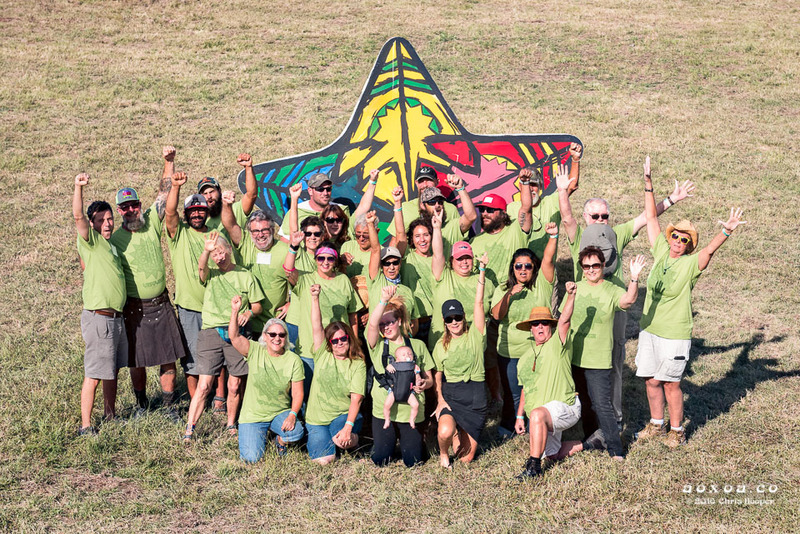 Camping and exploring on this land is a huge part of the appeal and success of UTOPiAfest. 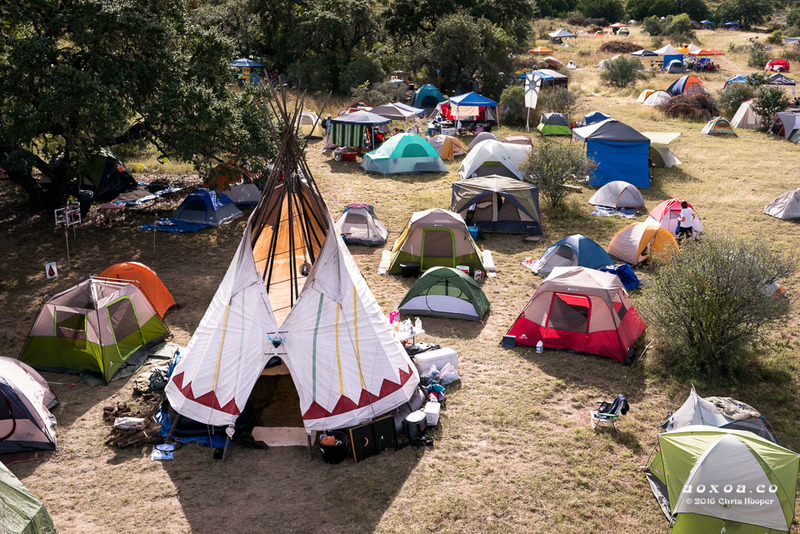 The tipi is a beacon of coolness among in the campground. 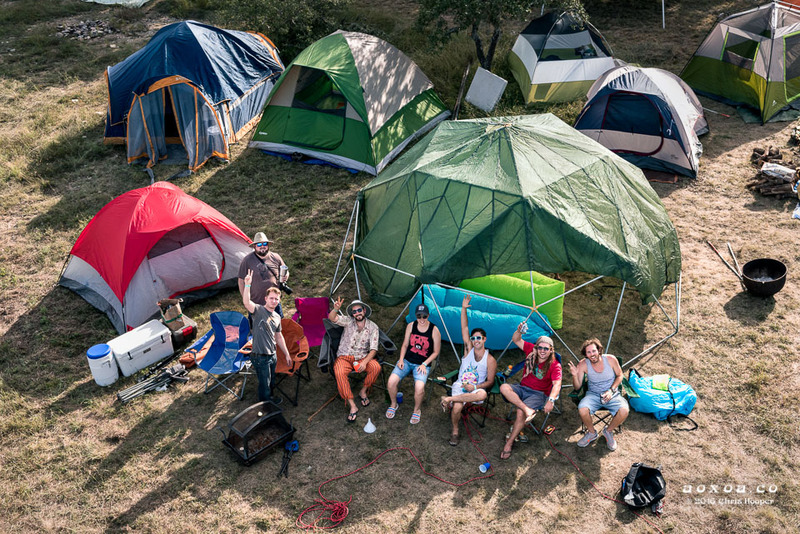 You’re camping here to see, do and hear things that are different, exciting, and inspiring. Campers in a live oak grove that stretchs to the hills. 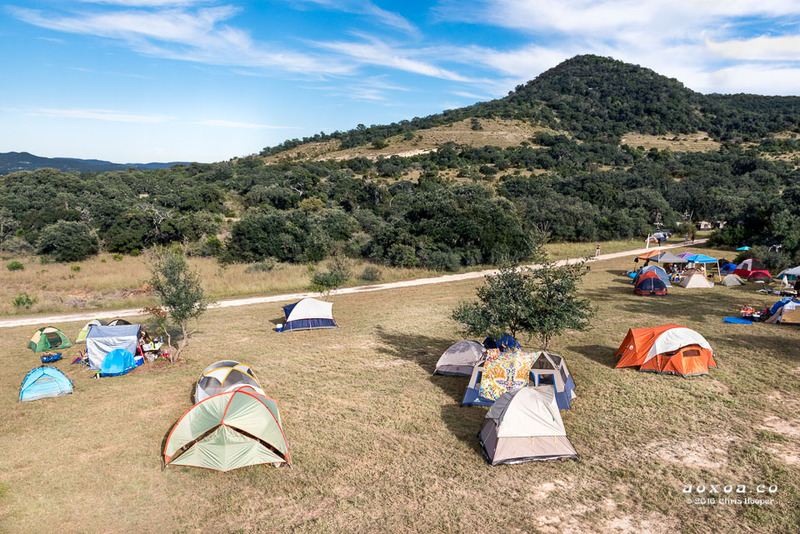 Campers relax around their tents while enjoying the fresh air of the Texas Hill Country. 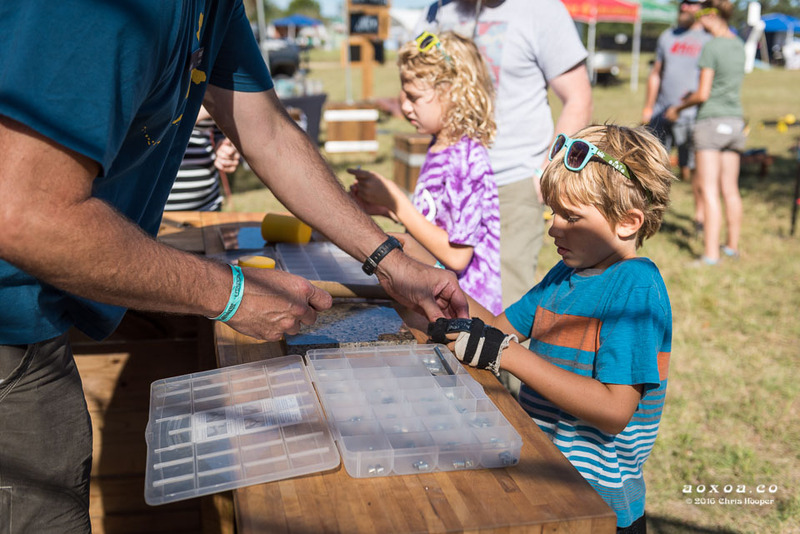 There is a two-mile hiking trail, a 9-hole disc-golf course, a five-mile mountain bike tour hosted by REI, many hidden trails that traverse the surrounding peaks and a night sky filled with stars. 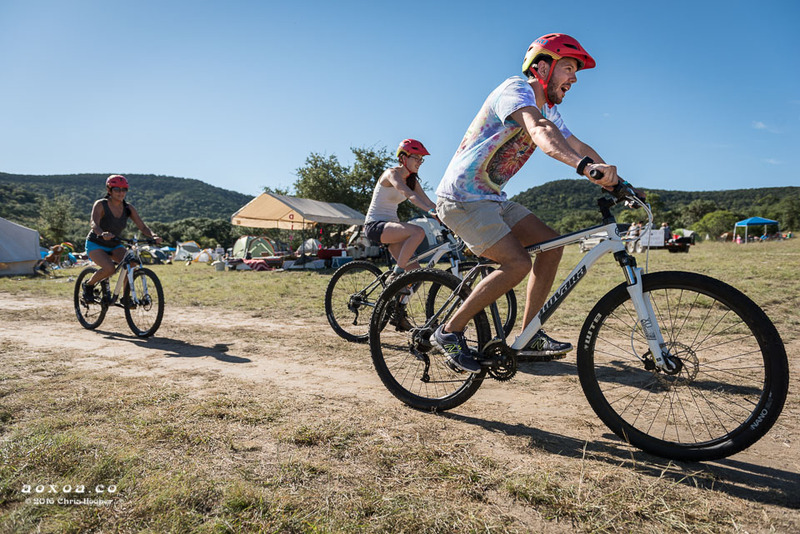 REI provides mountain bikes and a guided tour of the Four Sister’s Ranch. 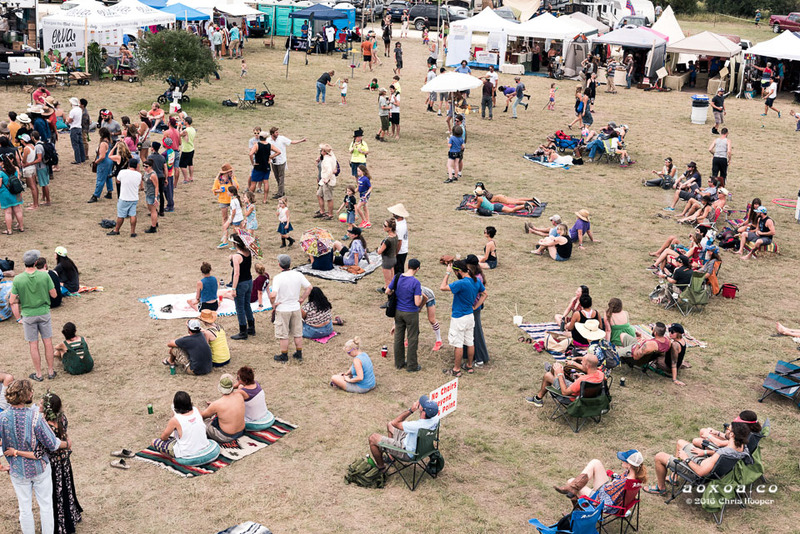 An area of the festival grounds where people make shade. 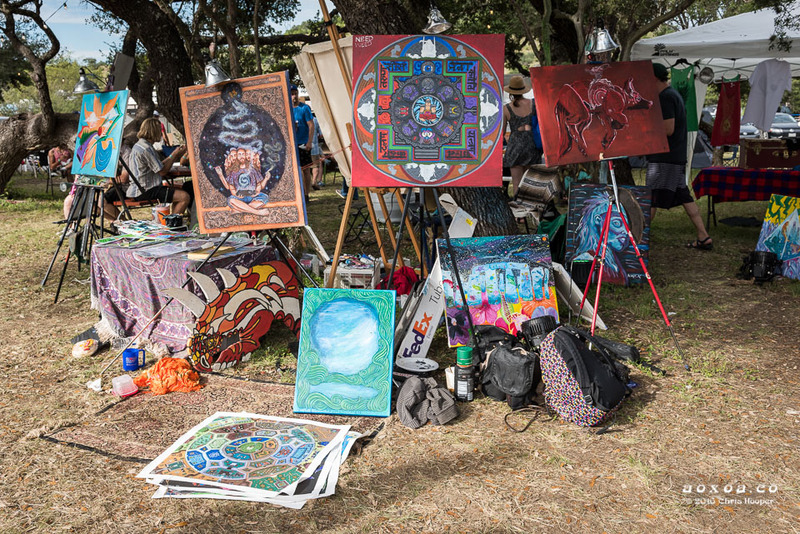 As if the lure of the hills isn’t enough, other elements of UTOPiAfest add to the appealing experience: learning workshops, vendors (food, art, etc…), fun loving people, yoga and an awesome bring your own drink and food policy. You won’t find many fences or barriers that impede your ability to freely go where you choose. Absent from the festival are overbearing ego driven security personnel rummaging through your backpack every time you enter the grounds. Morning flow yoga courtesy of Yoga-Yoga. 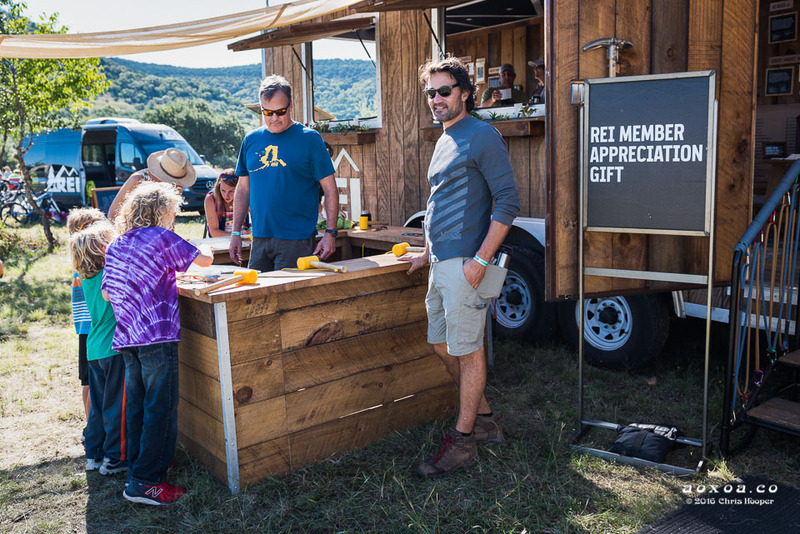 REI appreciating members in their village where you can get free sunglasses. Kids are a welcome element to the all inclusive atmosphere. 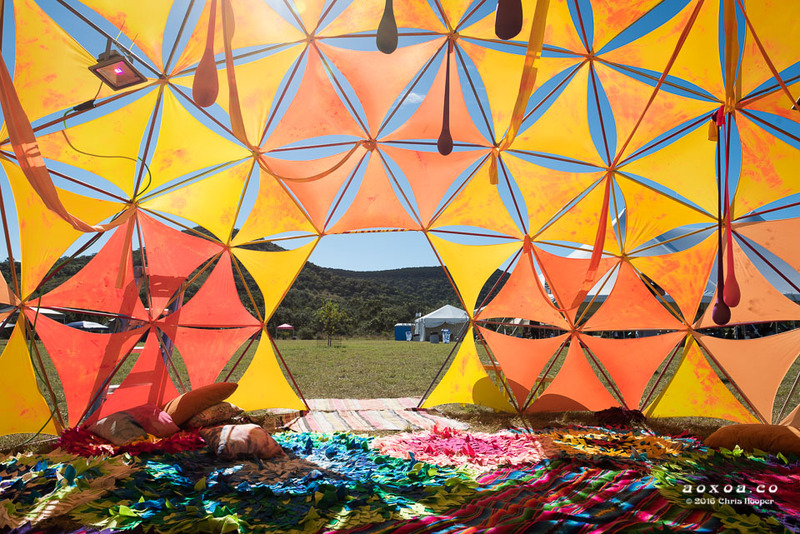 The color dome for chilling. Artist create onsite for your enjoyment. 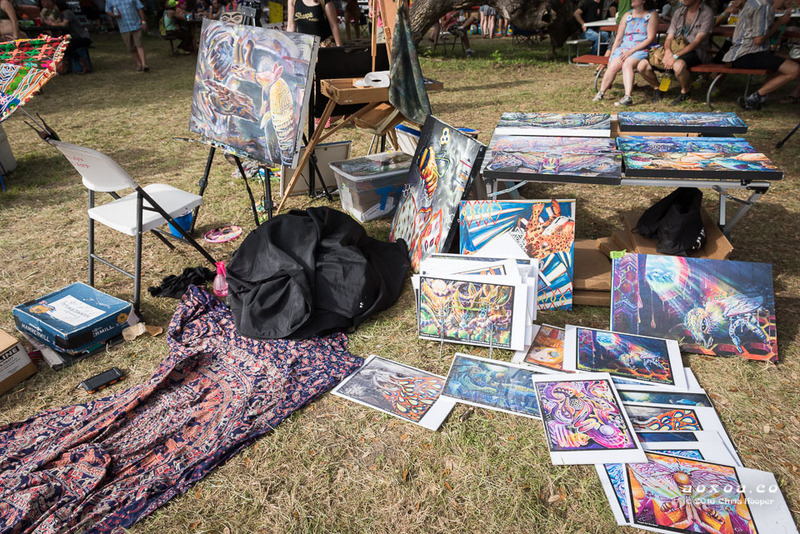 Art vendors set up along the grove. The outskirts along the Cypress stage at 4:30pm. A look at the Cypress stage at about 4:30pm. Nice. As an added bonus you get live music. 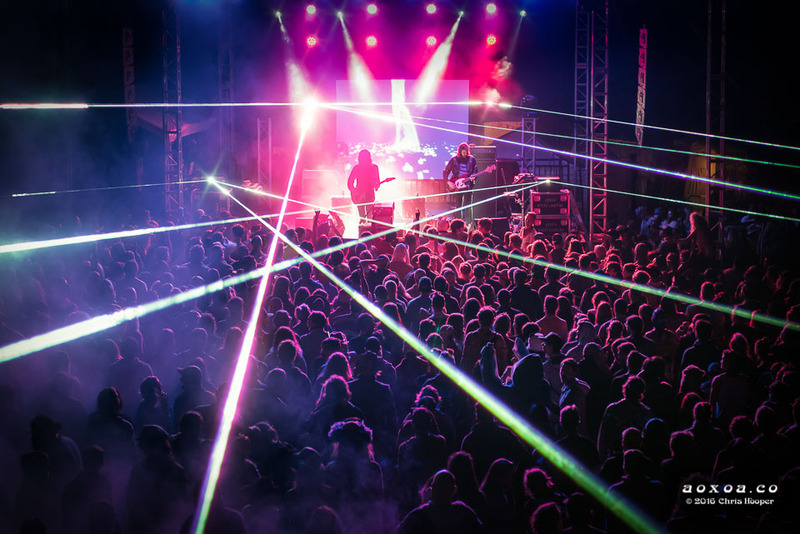 You won’t see Bassnector or Robert Plant and The Sensational Space Shifters rocking the Cypress stage anytime soon. 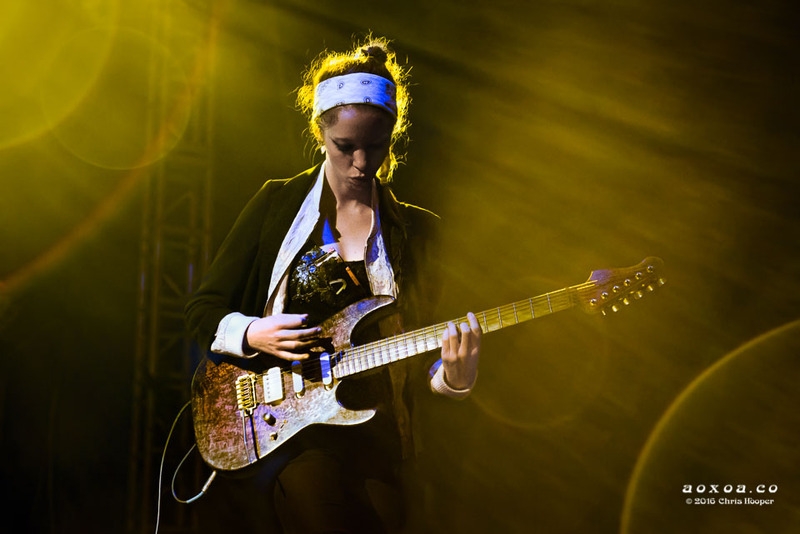 But, you do get 3 days of high quality music that spans genres in an interesting and satisfying way. 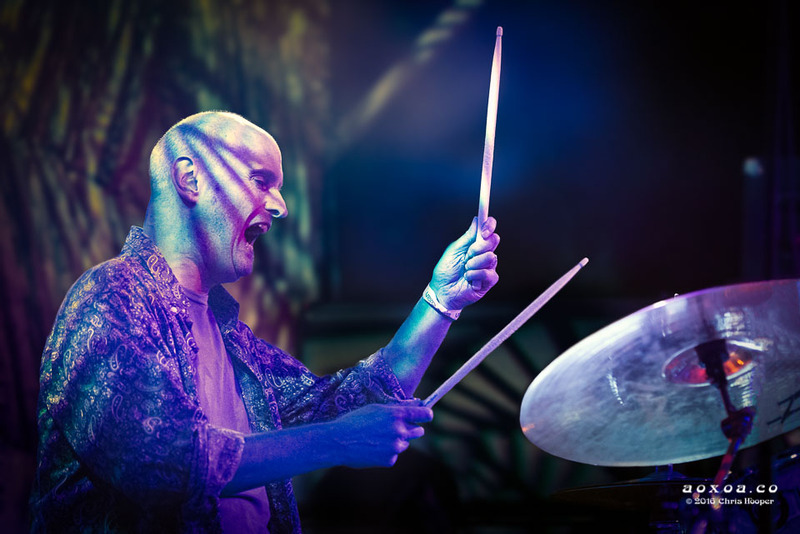 With over 25 performances, you’ll appreciate non-overlapping shows and a relatively sparse crowd that is capped at 2,000 attendees. 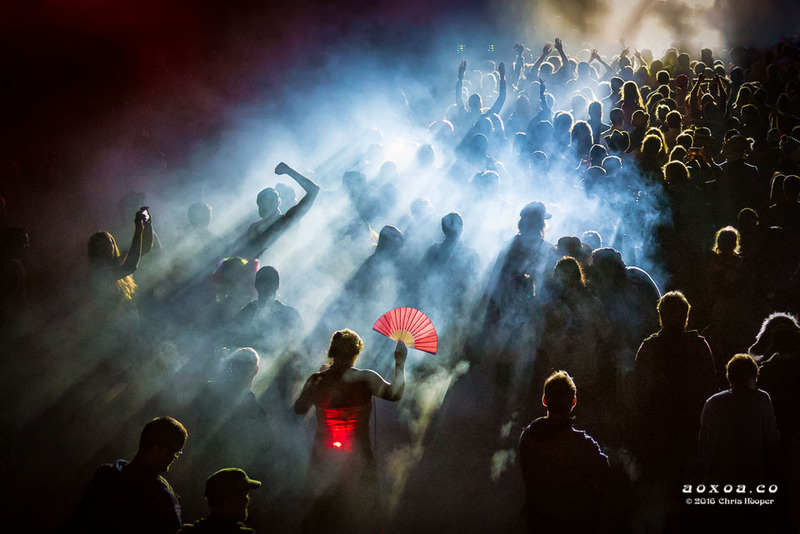 This dramatic image has many nice elements in it: light streaked smoke, a woman capturing a clip, a guy fist-pumping to the beat and the fan lady. 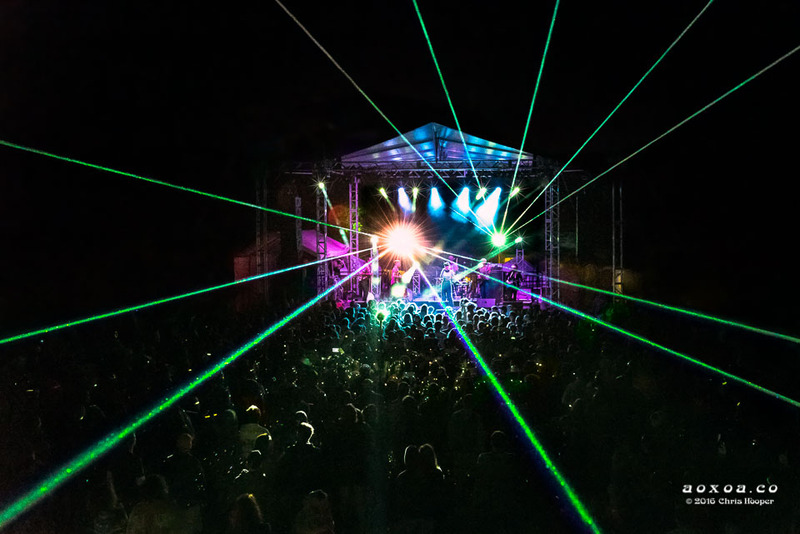 Headliners for UTOPiAfest 2016 included RATATAT, Victor Wooten, Thao & The Get Down, White Denim, Rubblebucket, Givers, CHALI 2na, Man or Astro-Man, Vapors of Morphine and the Whiskey Shivers. 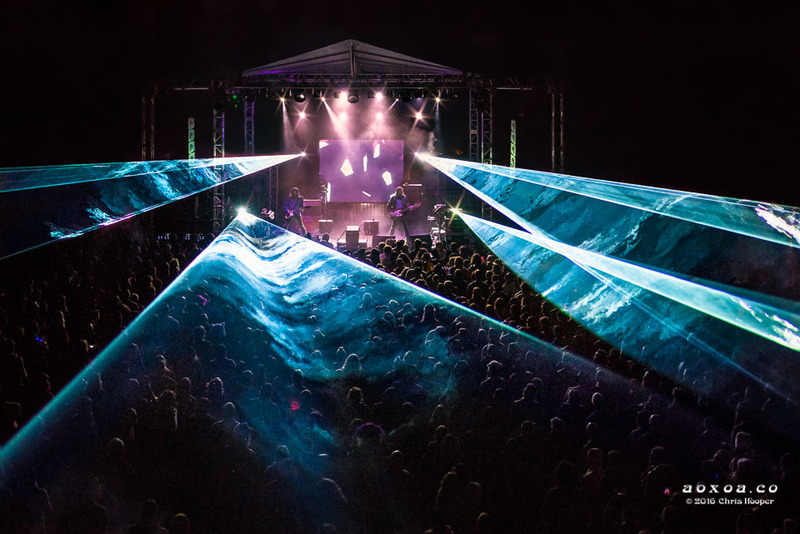 Lasers at the Cypress stage. 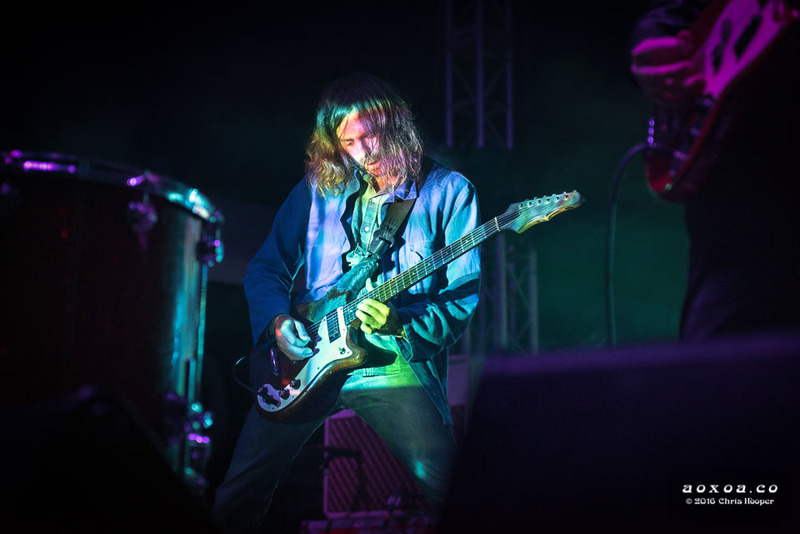 Friday featured 12 performances that alternated between the Cypress and Arrowhead stages. The shows ran uninterrupted from 2:15pm through 1AM. Afterward, late-night jams continued with a silent disco at the Four Sister’s Tent and/or non-amplified acoustic sets at Tank Goodtimes. 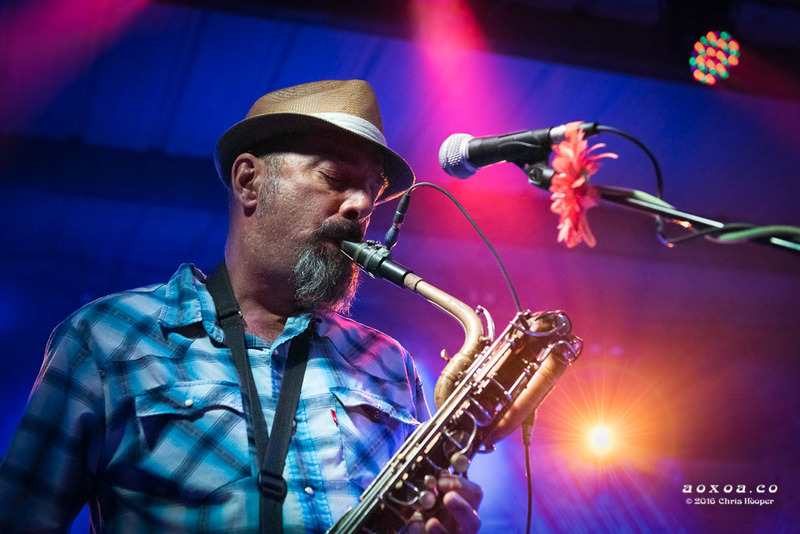 My personal favorites for this UTOPiAfest 2016 review include: Vapors of Morphine, Rubblebucket and Victor Wooten. 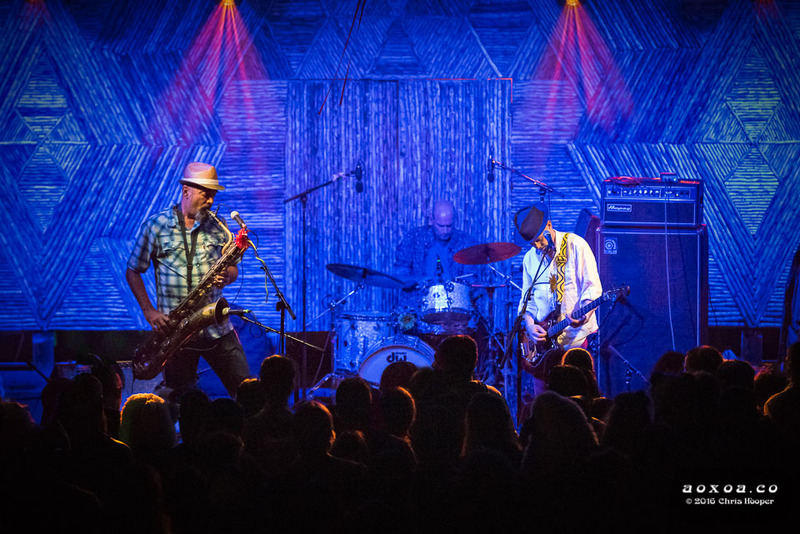 Vapors of Morphine is an American rock band founded in 2009 from the ashes of internationally acclaimed Morphine. Vapors of Morphine on the Arrowhead stage. Dana Calley on baritone sax. 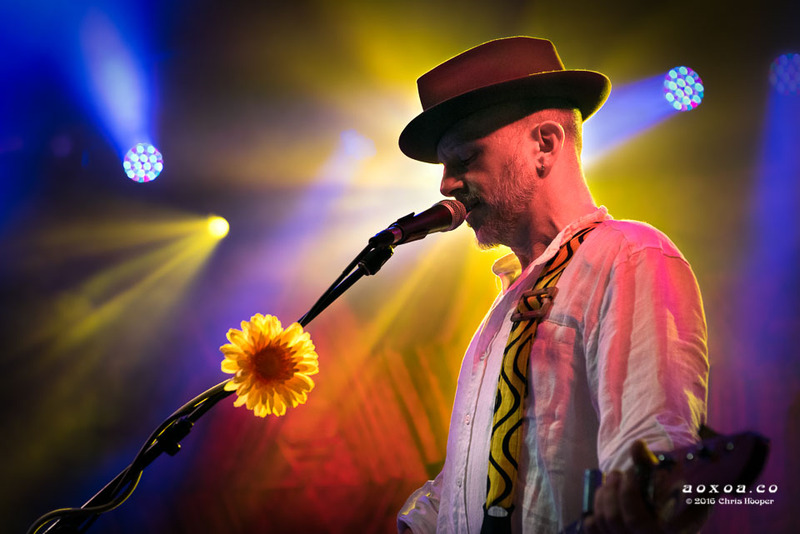 Jeremy Lyons (vocals, guitar, 2-string slide bass, electric bouzouki). 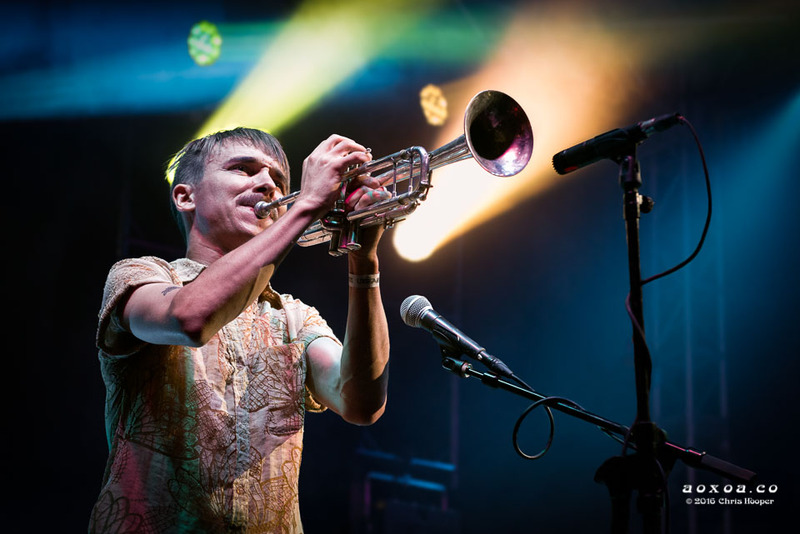 Rubblebucket was awarded SPIN Magazine’s “Must-hear artist from the 2009 CMJs” and the Boston Music Award for Live Act of the Year. In 2010, Paste Magazine included their Beatles cover “Michelle” on the list of 50 Greatest Beatles Covers of All Time. 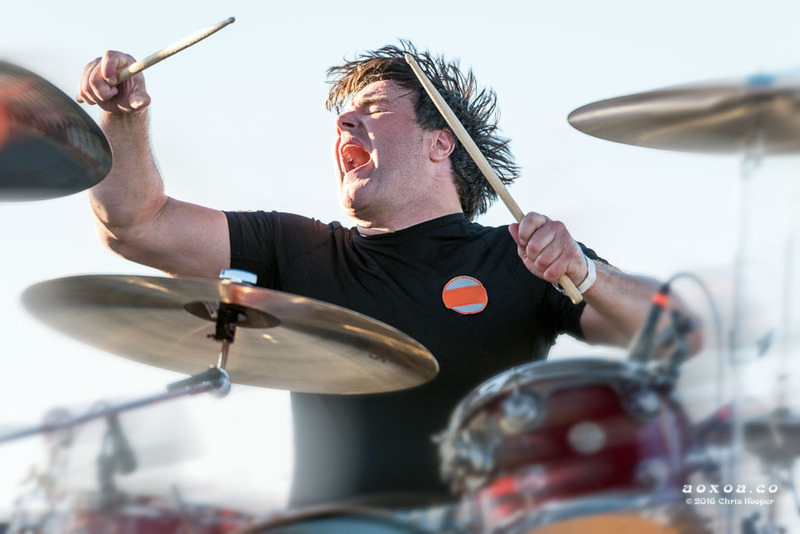 The band performed on Jimmy Kimmel Live in 2012. 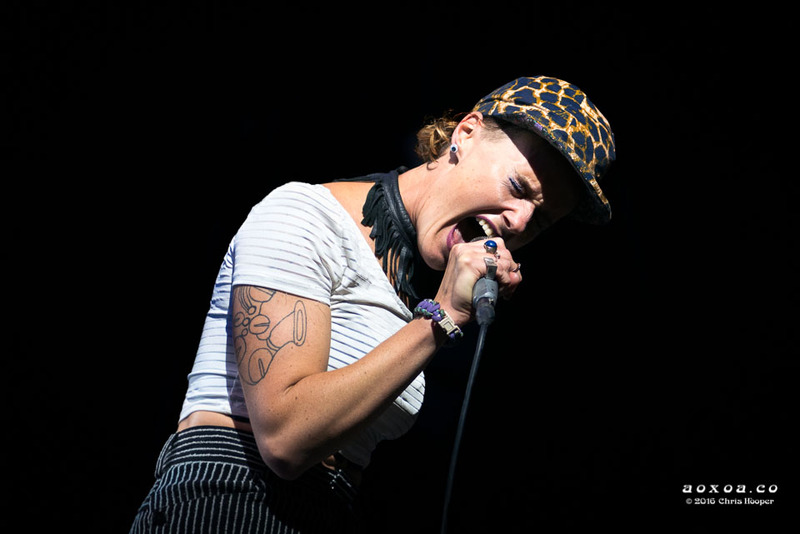 By 2014 Rubblebucket was firmly supported by many online publications, radio stations and the track “Came Out Of A Lady” was featured in the film Drinking Buddies. 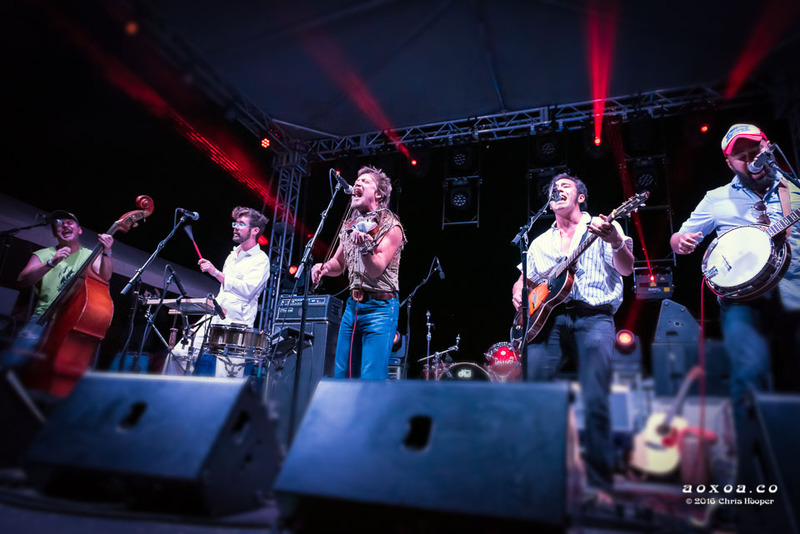 Rubblebucket, an American indie-dance band from Brooklyn, NY. 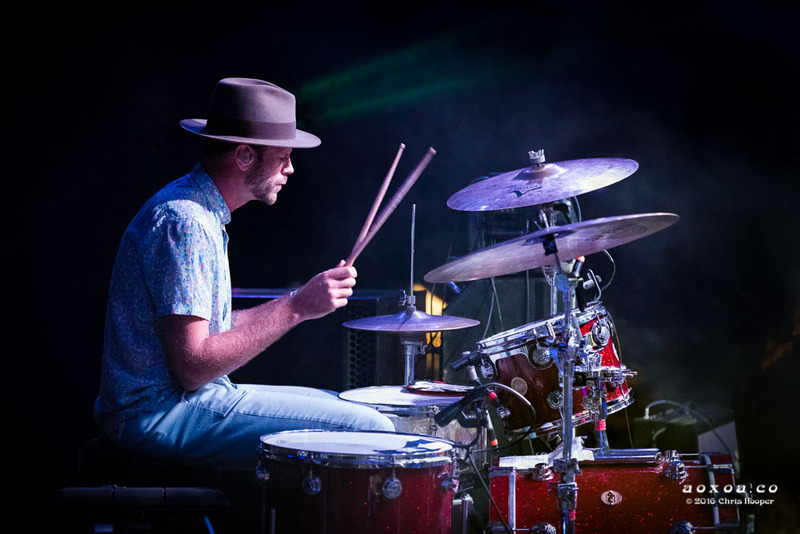 Alex Toth of Rubble bucket (trumpet, backing vocals, flute, percussion, bandleader). Kalmia Traver of Rubblebucket (lead vocals, tenor and baritone saxophones, flute). 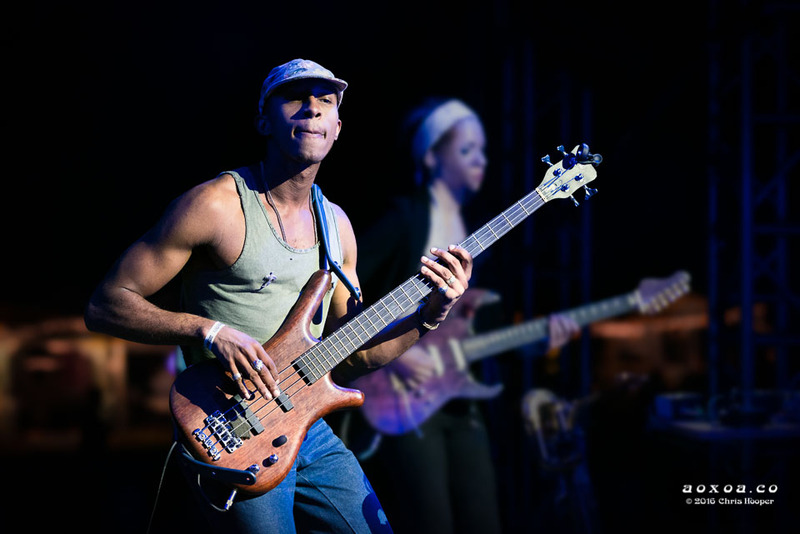 Victor Wooten is an American bass player, composer, author, producer, and teacher. 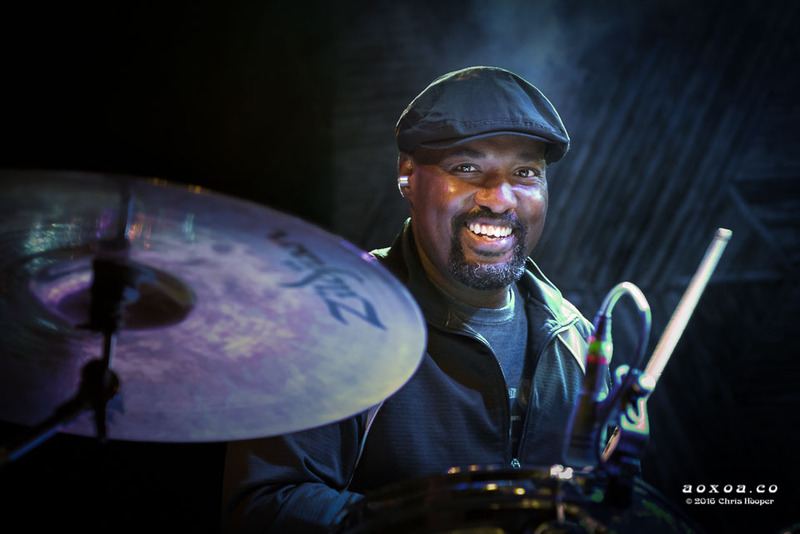 He received five Grammy Awards, won the “Bass Player of the Year” award from Bass Player magazine three times in a row, and was named #10 in the “Top 10 Bassists of All Time” by Rolling Stone. 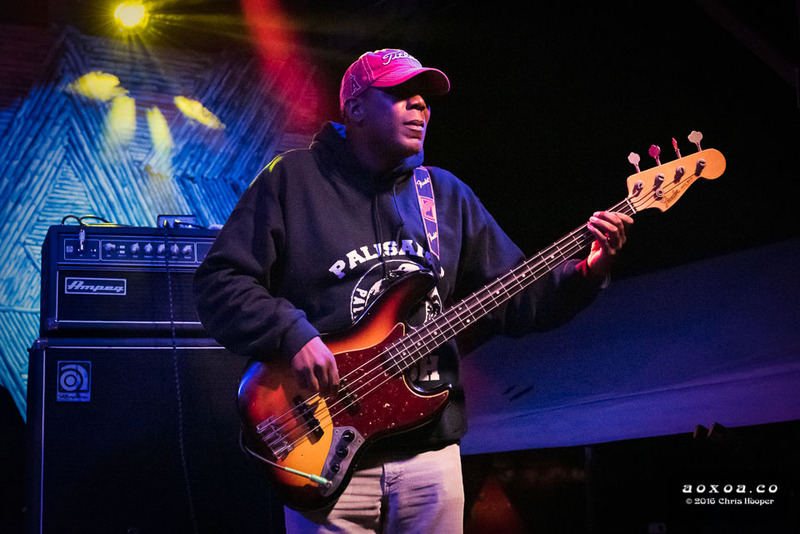 Wooten is bassist for, and an original member of, Béla Fleck and the Flecktones. He also enjoys a prolific solo career with many collaborative works. 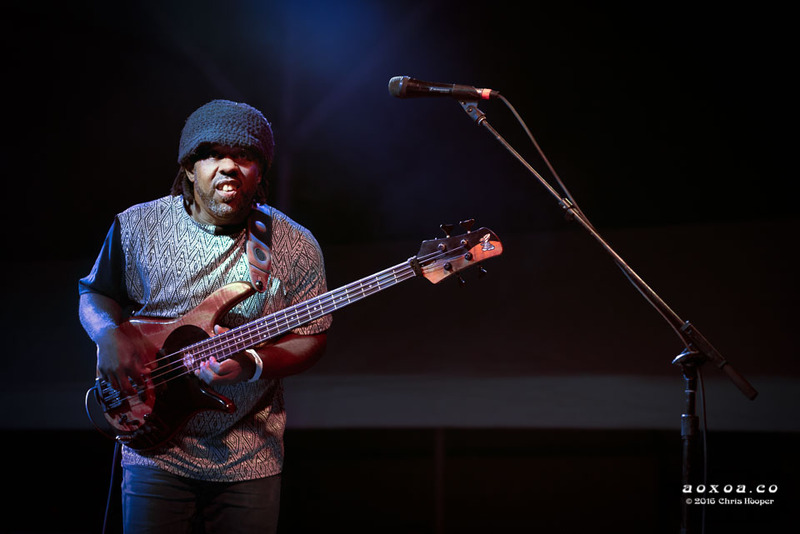 Bass virtuoso Victor Wooten is a “Performance Scholar in Residence” at the prestigious Berkley College of Music in Boston. 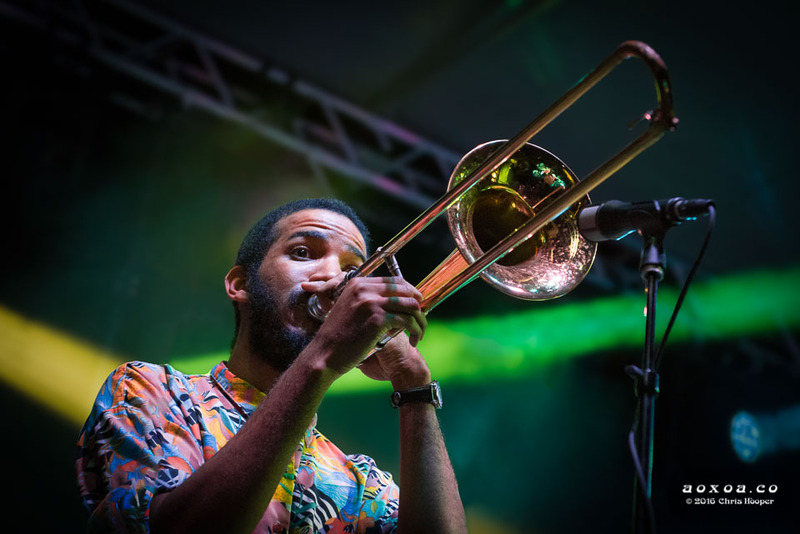 Saturday featured 12 performances that alternated between the Cypress and Arrowhead stages. The shows ran uninterrupted from 2:15pm through 1AM. Afterward, late-night jams continued with a silent disco at the Four Sister’s Tent and/or non-amplified acoustic sets at Tank Goodtimes. 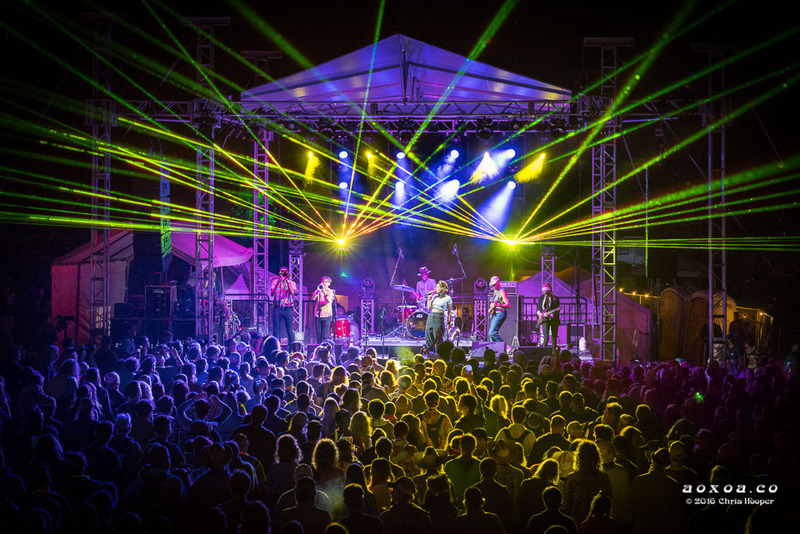 My personal favorites for this UTOPiAfest 2016 review: Man or Astro-man?, Whiskey Shivers, Thao & TGDSD, Chali 2na, and RATATAT. 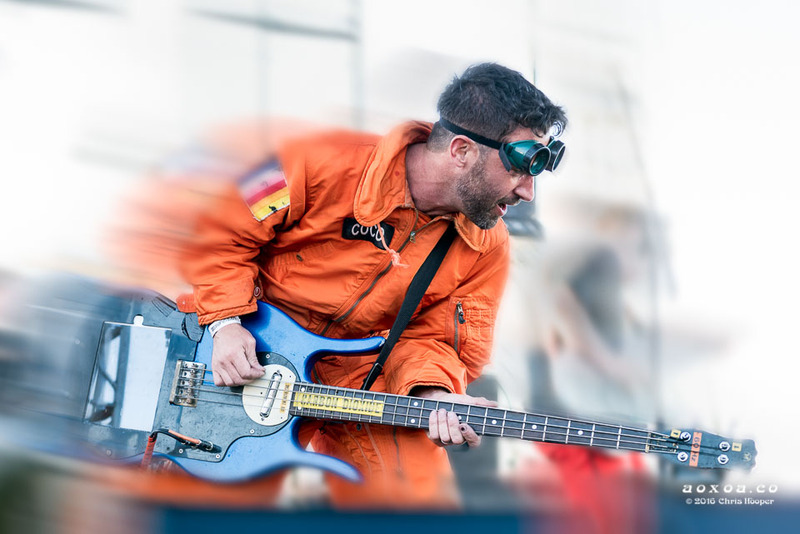 Man or Astro-man? 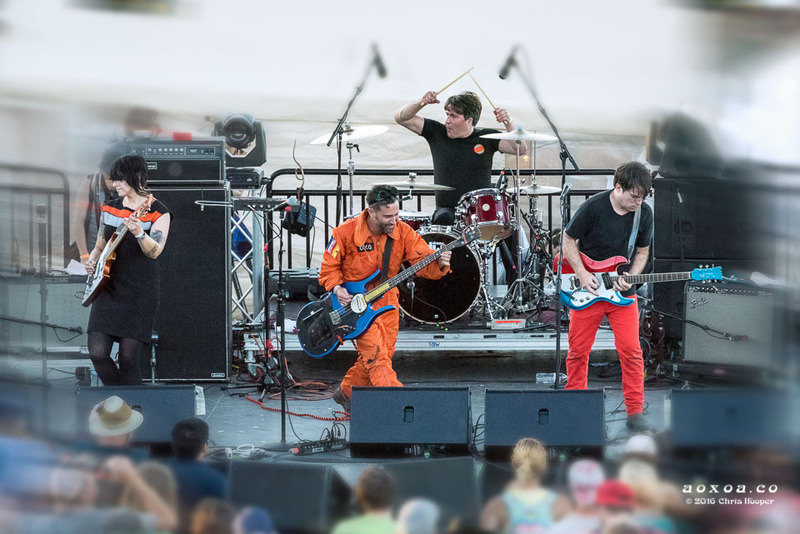 is a surf rock punk inspired group that came to prominence in the 1990’s alternative scene. They recorded 10 albums between 1993 and 2001 before going into deep space. They returned to earth in 2010 and produced another album in 2013. Thankfully, a sighting was reported in the remote Texas Hill Country in 2016. Man or Astro-man? Always space traveling. 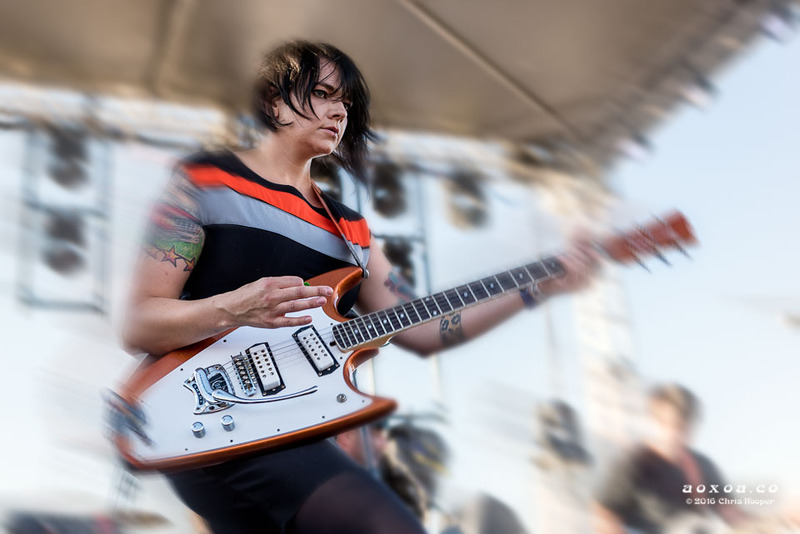 Avona Nova of Man or Astro-man? Coco “Electronic Monkey Wizard” of Man or Astro-man? Birdstuff of Man or Astro-man? Star Crunch of Man or Astro-man? Whisky Shivers: Andrew VanVoorhees (bass, vocals), Joe Deuce (washboards), Bobby Fitzgerald (vocals, fiddle), Jeff “Horti” Hortillosa (vocals, guitar), and James Bookert (banjo). 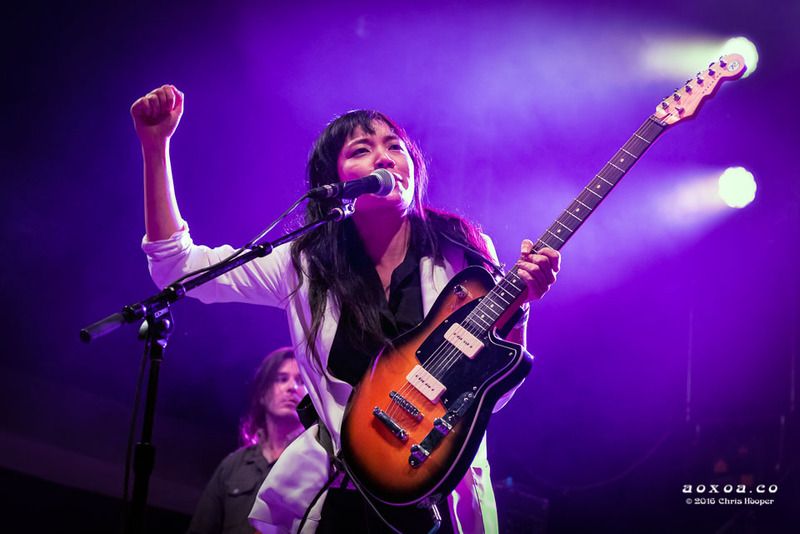 Thao & the Get Down Stay Down is an alternative folk rock music group based in San Francisco, California. 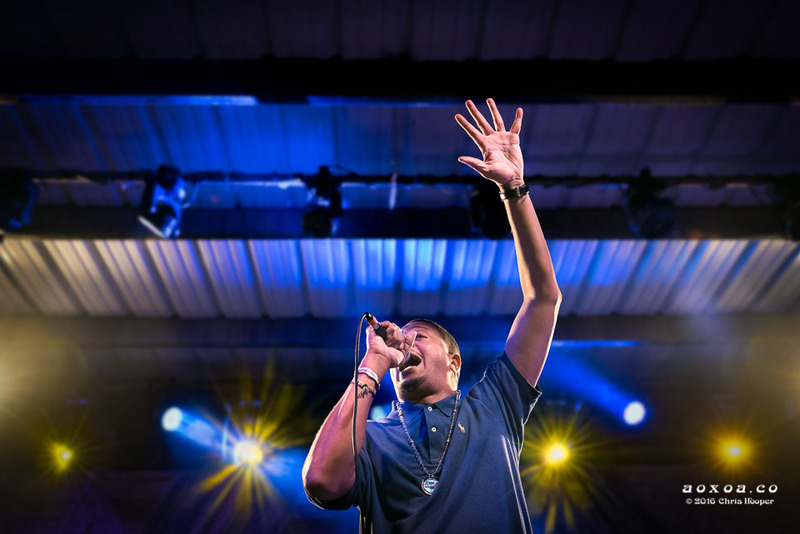 Chali 2na, is an American rapper and hip hop artist, associated with the groups Jurassic 5 and Ozomatli. He is known for his baritone and quick delivery rapping style. —Wikipedia. 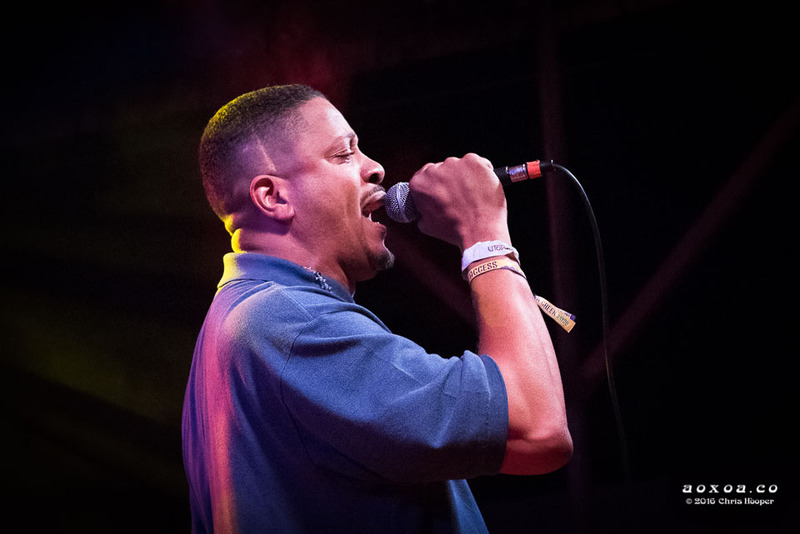 Charles Stewart (AKA Chali 2na). 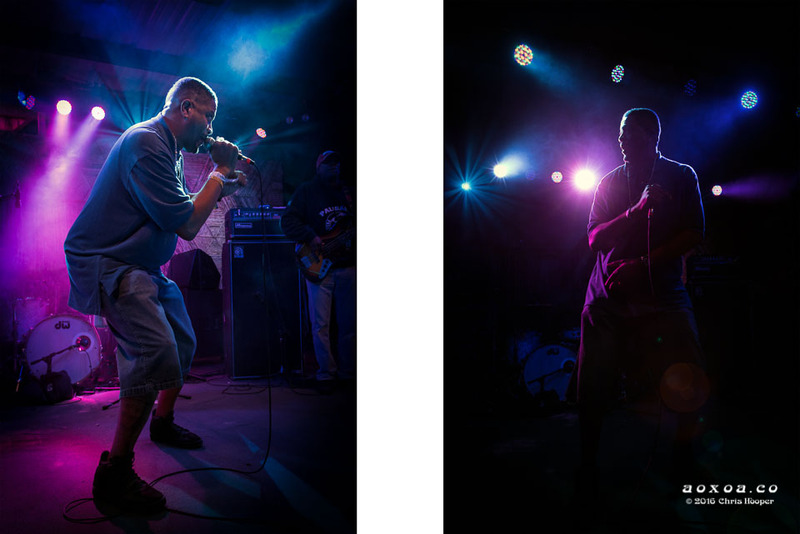 Chali 2na with his rapid fire baritone rapping style. 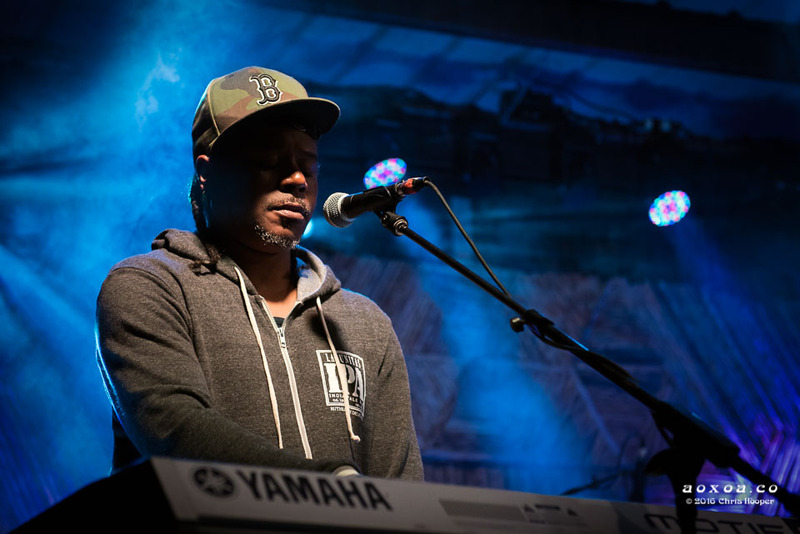 Need name of keyboard player with Chali 2na. Need name of bass player with Chali 2na. 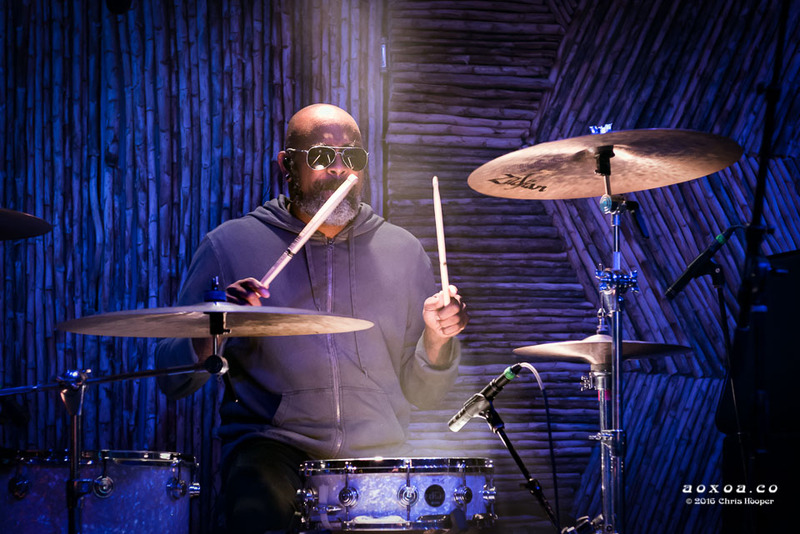 Need name of drummer with Chali 2na. Chali 2na going five up high. 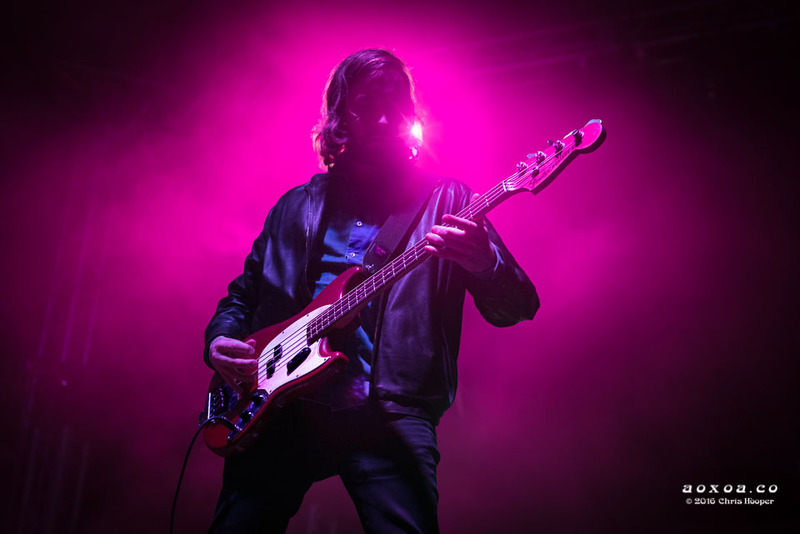 RATATAT on the Cypress stage at UTOPiAfest 2016. 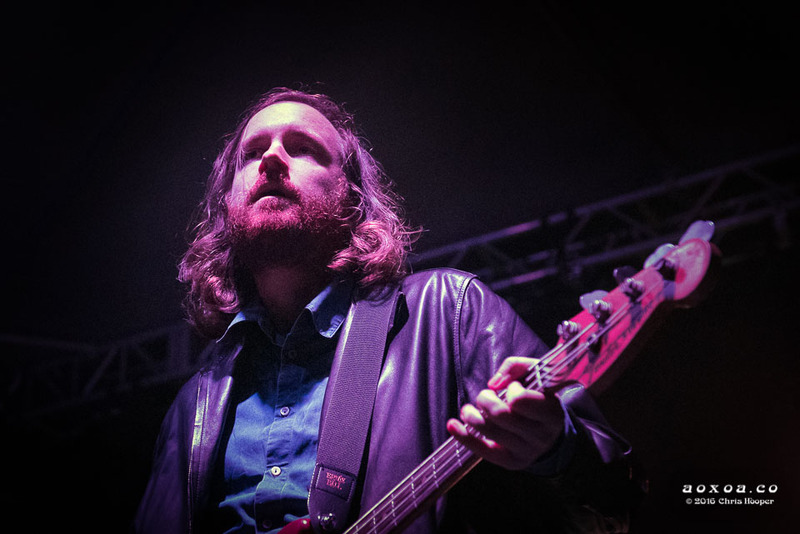 Evan Mast (bass, synthesizers, percussion). 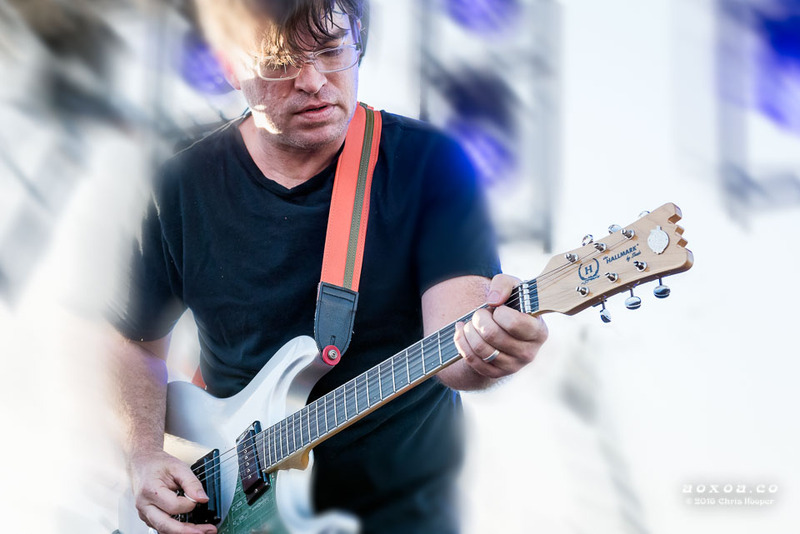 Mike Stroud (guitar, melodica, synthesizers, percussion). 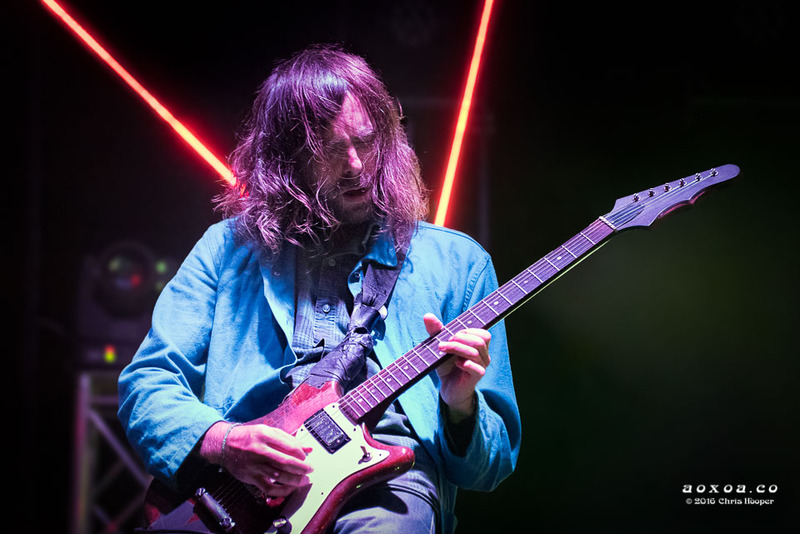 RATATAT on the UTOPiAfest Cypress stage playing neo-psychedelia experimental rock with slight electronica. 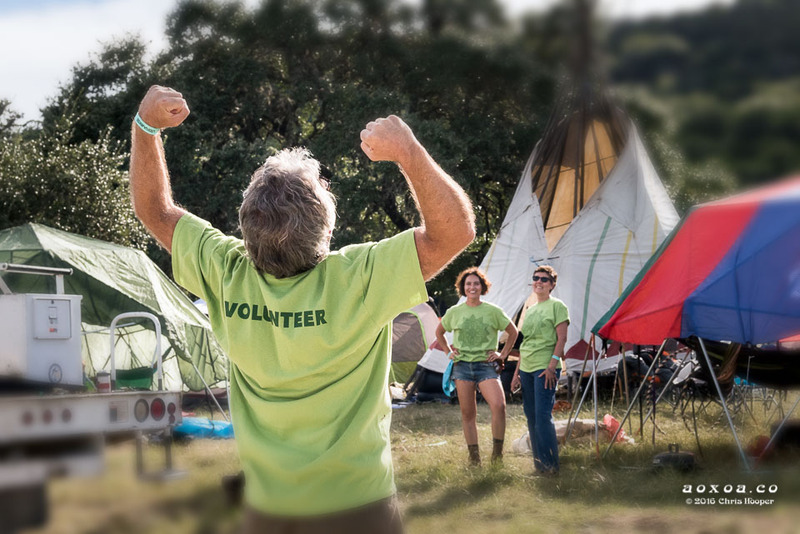 Grrrr…don’t make us PAY $20 to volunteer! The Keep Utopia Beautiful booth with Claudia Rogers. The Green Team is your dream team. 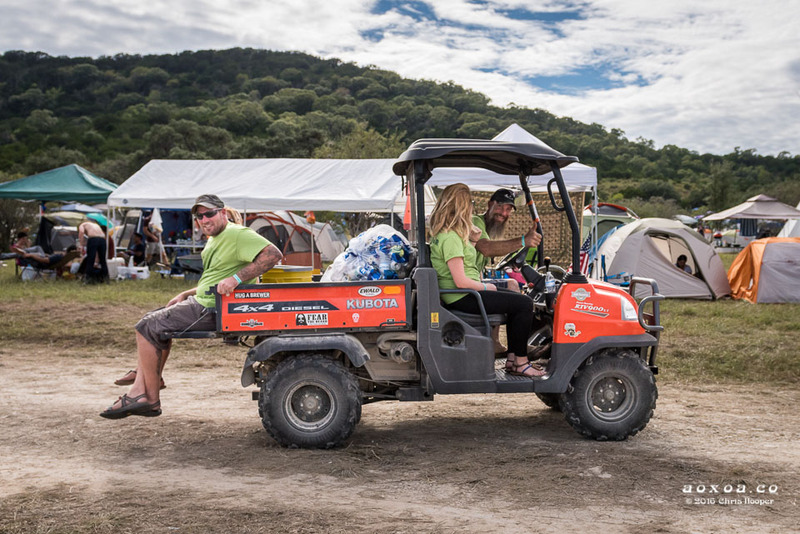 Making the rounds in the Kubota. It is clean because of the Green Team. West end of the the primitive camping area. I spy two tipis.